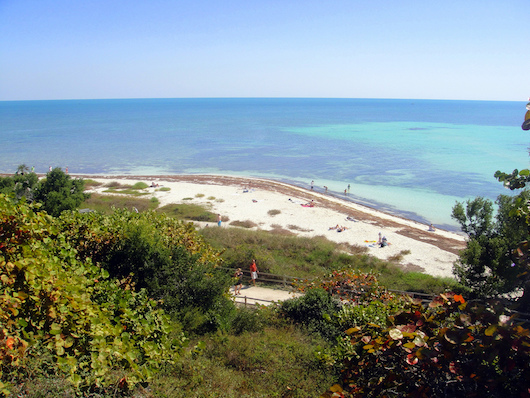 This state park is known for gorgeous white sandy beaches and great snorkeling. It also offers one of the better running opportunities outside the OHT, and off of Rt. 1. There are 3.5 miles of paved roads in the park, popular with bikers and runners. There isn’t too much traffic. It is 1.8 miles from Sandspur Beach to the railroad bridge in Big Pine Key. The park also has three nature trails which feature some boardwalks, which make for a nice spur (they aren’t that long). The 0.6 mile Silver Palm Trail, at the northern end of the park, has the largest grove of silver palms in the U.S. Note: As of October 2017 the park is closed due to Hurricane Irma. Check the website for updated information.